Cisco is one of the most recognized high technology companies around the world. With annual sales just under $20 billion, Cisco is the gorilla of the networking communications marketspace. Beating the gorilla is a formidable challenge for any start-up. However, privately funded Veraz Networks did just that at Transcom, one of the world’s largest wholesales voice over IP carriers. In a deal valued at $10 million, it was recently announced that Transcom would be using Veraz Network’s gear to replace all of their installed Cisco gateways. How did they beat the Cisco– the gorilla? Most people assume that business is based solely on logic. After all, the high-tech industry is comprised of learned people with advanced degrees in the sciences of computers, math, engineering, and business. Therefore, we logically assume we are dealing with rational decision-makers. As a result, we focus on the logical and procedural aspects of the sales cycle. We prospect for customers, qualify the opportunity, explain the merits of our solution, and hopefully, negotiate a purchase. The majority of the discussions we have with potential customers are based on the rationale behind the selection of our products. We offer facts, features, specifications, performance metrics, ROI’s, and business benefits. And, our sales process is oriented around the communication of this information. Unfortunately, our competition offers equally compelling reasons and statistics. In fact, the confusion this creates many times leads to customer paralysis and decision postponement (another feared competitor). The “real” sales process is the process of building a relationship with the customer. However, the entire high-tech industry is predominantly focused on technical arguments when there is very little product differentiation in the customer’s eyes. As an industry, we have become enamored with the technical mantras provided by our marketing departments. While they are important, there is an entirely intangible human side to the sales process that is actually responsible for the decision made. It is the art of mastering the human nature of high-tech selling that is the real difference between the winner and losers. In essence, it is the sales team that builds the greatest customer rapport and the strongest personal relationships that will command the day. Three attributes are at the foundation of building the winning customer relationships. First, you need to speak each customer’s unique language. Successful communication is the key to all relationships. Second, you must create an unbreakable bond between individuals. You accomplish this by understanding their personal needs, wants, and motivations. Finally, you must convince the “entire” person to buy. You need to persuade both the logical conscious mind and emotional subconscious mind. Let’s review each of these attributes further. Salespeople create a relationship between companies based upon the process of communication between people. This process is very complex. However, since we naturally communicate all the time, we underestimate the complexity of communication and take the process for granted. We tend to ignore the subtleties and for the most part become preoccupied with our side of the conversation. Most people recognize someone’s spoken words as the most significant element of communication. However, this represents only a fraction of the communication process. The language a person uses is composed of both verbal and nonverbal communication and occurs in layers. It is through the use of this “whole” language that we express our needs, wants, and desires to the outside world. By comparing how computers speak to one another with how people communicate with each other, we can begin to understand the multiple dimensions of information that are constantly being transmitted. Computers connect to one another via established standards. Standards are required because the wide range of computer manufacturers use a diverse set of operating systems (Unix, NT, Linux and so on). Within the computer communication model, layers of functionality are needed to have one computer “talk” with another. Once these layers are in place, information can be sent from one machine and the exact information will be received and deciphered by another machine. Mary, could you please send the report. MARY, COULD YOU PLEASE SEND THE REPORT! All these sentences use the same words but result in very different interpretations. When Mary reads the first sentence, she will feel a low sense of urgency and receive no indication of any unhappiness that the report has not been sent. The other sentences imply a different sense of urgency, and even discontent, that the report hasn’t been sent. People, like computers, also have layers of communication called the Human Communication Model. However, these layers are much more flexible and can be combined in many different ways. Layers can be entirely eliminated or they can be fused together to form entirely new meanings. The layers of the human communication model are defined below. Phonetics- The phonetic layer is the enunciation of the actual words we have strung together in the form of a sentence. This layer can alter the meaning of the sentence to convey a completely new and/or sometimes opposite meaning. For example, let’s say I tell my wife, “Your hair looks great,” but my voice trails off at the end of the sentence. She would immediately be concerned that her hair does not look good. Phonetics are both consciously and subconsciously applied. They are typically not recognized as part of the communication event except when it becomes so obvious that it changes or contradicts the meaning of the words spoken. Purpose-The third layer is the “purpose” of communication. Words are assembled together to communicate an ideal or experience. Every sentence of every conversation between customers and salespeople are purpose driven. One way to think of this is that they both have an ulterior motive for everything they say. Of course, you and I have been communicating with selfish interests all of our lives. Neroulinguistics- Although it weighs only three pounds, our brain is infinitely more complex than any computer. The brain has an incredible capacity to sort, prioritize, and process information. We organize our world according to the information received by our senses (sight, sound, and touch), and we use language as the method to describe what we have experienced. The language we use is dependent upon an individual’s unique wiring of the brain. Neurolinguistics is the study of how brain interprets and uses language. Great benefits in communication are gained if you understand your customer’s neurolinguistic wiring and adjust “your” communication style to fit “their” world. Internal Dialogue- Every waking hour, a stream of communication is going on inside your mind. You are always talking to yourself. This conversation is an unedited, honest discussion that represents your deepest feelings. This is the fifth layer of the human communication model – the “internal dialogue layer” or the “internal dialogue.” Usually, the customer’s external words being spoken are a subset of the internal dialogue. In between, is an editing process to filter the precise answer. Salespeople want to hear the truth from the Internal Dialogue. Physical- Everyone is well aware of the final layer of human communication model, the “physical layer,” also known as body language. Body language is unique in that it is a three-dimensional language. Body language can be very subtle or more powerful than the actual words being spoken. When taken in conjunction with the other layers of the human communication model, body language plays an important role. Unlike the layers in the computer communication model which are structured like a building with floors on top of another, the Human Communication Model layers are more like piano keys. All the keys may be pressed at one time or only certain keys may be pressed. Different sounds, or meanings, are created by pressing particular keys together in patterns or repetition. Piano keys may be depressed harshly or softly, just as communication may be explicit or subtle. The combination of keys may result in a soothing melody that the customer wants to hear over and over or just noise. During the early `90s, the term “win-win relationship” was being used everywhere to explain how to successfully negotiate your position while still enabling the other party to achieve its goal. However, the concept of win-win relationships does not go far enough in understanding human relationships. Relationships are created when people share the same activities or when they are motivated to achieve the same goals. Goals can be defined into very personal prioritized desires, called “benefactions,” where there is a personal benefit from taking an action. The salesperson’s goal is to understand the benefactions of each member of the selection team. A benefaction is something strongly desired, defined in a personal expression that is important to you. Each decision-maker has a very private and personal benefaction. For instance, the manager of the department may view the cost savings of implementing the product as the main goal. His benefaction may be being rewarded with a bonus for reducing the department’s expense structure (which he will use to buy the new car he or she wants). The person in charge of implementing the solution may view manageability as the goal. Since he will have to devote less time to managing the new product than the current one, his benefaction may be to have more time to spend on the projects he enjoys (or less time at work and more time at home with his or her family). Your conscious mind is obsessed with benefactions. The most vital benefactions are driven by your physical well-being. If you are hungry at the moment, you may have difficulty concentrating on reading these words. If you haven’t eaten for the past twenty-four hours, you would definitely be more interested in food than any concepts on these pages. The conscious mind is fixated with the avoidance of pain, the preservation of self, and self-gratification. Most likely, the Heavy Hitter’s process of assimilating all these data points is not formalized. Rather, it is both a conscious and subconscious process. Although the subconscious mind is not actively assertive, it is always vigilant and capable of influencing actions. The ability to effectively send and receive information from each layer of the human communication model is a critical component for developing sales intuition. While it is easy to recognize the communication being sent consciously, the subconscious information being sent is just as expressive, but much harder to recognize and interpret. It is important to realize that the subconscious and conscious are communicating at all times, internally within the self and externally to others. Whatever your age and experience in life, you have already mastered how to use language. As a child, you learned the complex process of conveying your thoughts, how to tell the truth, and how to lie. You have become an expert on the nuances of how to say something with maximum impact, and understand, that sometimes what’s important isn’t necessarily what you say as much as how it is said. You already know how to create a message with a clear and a compelling sense of urgency. However, truly great salespeople amplify their use of language by adding an additional dimension of meaning and structure within their usual conversations with the customers. By doing so, they instill their suggestions into the customer’s thought process with what seems like telepathy. The common term for this is “persuasion.” Persuasion is not solely a recital of logical arguments or factual information to a customer. Instead, it is process of projecting your entire “beliefs and convictions” on another human being. That’s why the founder of the start-up is usually the most important salesperson in the company– because he or she truly believes! Benefactions affect your conscious activities as well as your subconscious mind. The conscious mind is obsessed with action and tactics to achieve benefactions. Meanwhile, the subconscious mind is constantly sensing and filtering additional data that may be necessary in the future. In computer terms, the conscious mind is like a point-to-point model. For example, a salesperson wants to check e-mail while traveling on the road. Using his laptop, he makes a dial-up connection to the host computer. His only concern is to get his e-mail, and once he checks it, he drops the phone line. This point-to-point connection is similar to the conscious mind focused on a specific benefaction. The subconscious mind is more like a broadband connection that is always on, such as a cable modem. The modem has a wider “band” of data and processes at a higher speed than a dial-up connection. The modem is always on, always receiving information. In the e-mail example, the salesperson is always receiving e-mail in real time. He or she doesn’t have to dial-up a connection. The customer’s conscious mind acts like an emotion suppressing system. It is full of doubt, cynicism, and distrust. It is the cautious skeptic that is continually protecting the buyer from making bad choices or forming ill-advised relationships. Therefore, even truthful, helpful information that is presented in the customer’s best interest tends to be discounted or ignored. In every conversation, both conscious and subconscious communication is being transmitted, assessed, and cataloged by each participant. And, each layer of the human communication model is capable of sending observable (conscious) and unobservable (subconscious) messages simultaneously. Although each listener can only receive a finite amount of information at any one time, very little of the information that is transmitted across all layers is lost. What isn’t consciously received is processed subconsciously. Relationships are expensive and they involve investments of valuable time. Customers have to spend time to determine whether a product’s characteristics are as they have been represented. They have to spend time evaluating other suitors to determine whether they are picking the best possible partner to solve their company’s business problem. They will have to spend time learning to use the new products they select, implementing them, and most likely, debugging or fixing product problems. These relationships also cost money. The customers will have to acquire the technology and pay ongoing maintenance fees to keep the technology current. They may have to pay for professional services or hire additional staff to help implement the solution. And they may need to buy additional technology in order to make the solution work. Building relationships requires rapport. Building rapport requires the complex process of human communication. Unfortunately, many high technology companies today are making two common mistakes. First, the majority of sales training time is spent only on memorizing logical facts about their company, product, and competitors. Little or no training is given on communication skills. The second mistake is made during the hiring process. Most companies make previous experience in the same industry their main criterion for hiring. Since experienced people command the logical facts, they are assumed to be qualified candidates. A more important hiring criterion is a person’s communication skills, mental agility, and the ability to build relationships. In other words, how quick-witted or fast on their feet are they, are they able to solve complex problems real-time, and whether or not you enjoy their company. If you are in sales, you make your living by talking. If you were a pilot, you would attend years of flight training school and many hours of simulator training before you were allowed in the cockpit of a jumbo jet. If you were a lawyer, you would intensely study the law for several years and have to pass your state’s bar exam to ensure your proficiency. If you are in sales, you need to understand the use and interpretation of language. You need to understand the process of communication and how it determines the level of rapport that is established between people. You must be able to adapt your use of language to a customer’s thought process and personality. Language can be directly linked to a person’s behavior. It can be deciphered to predict future behavior, and truthfulness or used proactively to influence a person’s thinking or opinions. Posted in Relationship Building and tagged customer attention, Customer Message, customer relationship, customer service, customer support, sales on April 19, 2016 by softwaresalesjobsblog. By Michael Cannon, Founder, Silver Bullet Group, Inc.
One of the biggest points of execution failure when launching a new product is Marketing’s inability to successfully enable Sales (inside, outside, channel) to have an effective conversation with potential customers. Marketing has not figured out how to provide Sales with effective messaging, collateral, sales tools and sales training — vital tools that Sales must have in order to successfully persuade a prospective customer to buy. To complete the translation from high-level messaging themes to highly effective messaging and tools, we need a breakthrough in the way we think about customer messaging. We need a better way to identify the categories and types of messaging that Marketing must create and integrate into the collateral, sales tools and training provided to Sales. biggest points of execution failure and achieve greater market success. 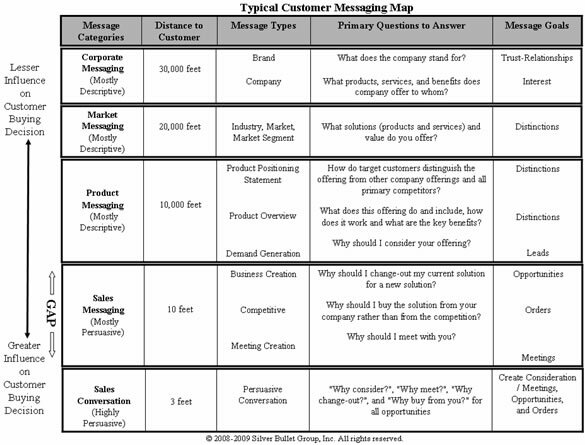 As the map above indicates, the primary reason Marketing is not successful in enabling Sales to have an effective conversation with potential customers is that the marketing team does not create sales messaging. Instead, it creates corporate, market, and product messaging, and then it tries unsuccessfully to use these categories of messaging to enable the sales conversation. The map makes it obvious why the current approach does not work. The messaging and the tools into which the messaging is integrated are not in alignment with the types of real-world questions potential customers are asking Sales – and Marketing, for that matter – to answer. Marketing must close the sales messaging gap in order to eliminate one of the biggest points of execution failure and to achieve greater market success. Before we align sales messaging with the TALC, let’s take a closer look at the business creation and competitive sales messaging types. Business creation messaging is mandatory in the early stages of the life cycle, when the most important customer question is, “Why should I change-out my current solution for a new solution?” The answer to this question has little to do with your company, per se. The primary goal of business creation sales messaging is to create demand for the product or service category by stating a compelling reason to change, convincing buyers that there is great value (Business Case) to be gained in changing from their current solution to a new or better solution. by stating a compelling reason to change. Competitive messaging is mandatory in the late-market stage of the life cycle, when market demand is more established. The most important customer question then shifts to, “Why should I buy the solution from your company rather than the competition?” The answer to this question must focus on competitive differentiation. The primary goal of competitive sales messaging is to create orders for your company, convincing buyers that your product is their best choice. In the Early Market and Bowling Alley phases, it’s all about business creation sales messaging. The primary reason the buyer is going to spend money, time and resources to change is that it will help him or her gain a competitive advantage or because it will help fix a broken business process. These are the two high-level business case themes for change. The role sales messaging plays is to help tune these high-level TALC messaging themes into highly persuasive reasons for the potential customer to spend money – and to spend it with your company. The more persuasive the reasons, the greater your market success. It’s that simple. for the product family I support.” — Nigel Mott, Product Sales Manager, Agilent Technologies, Inc.
As the quote above indicates, making this one change – creating TALC-aligned sales messaging and then integrating the sales messaging into the collateral, sales tools, sales training, etc., delivered to Sales and, ultimately, to customers – enables Sales and Marketing to increase their win rates by 15 – 20% or more. Now that’s greater market success. Posted in Staying on Message and tagged Customer Message, Market messaging, market strategy, sales, sales messaging, sales skills, sales tips on August 28, 2015 by softwaresalesjobsblog.